The presidential election of 2016 was unlike any in modern American history. Donald Trump, a successful businessman, well known reality television host and a political novice with no clear policy views or political attachments, ran for the presidency. His opponent was Hillary Clinton, a candidate with a long and impressive career in politics. She was the first woman nominee of a major political party and, should she have won, the first woman president of the United States. No one gave Trump much of a chance. Yet he won the election. How did he do it? What explains his political success? What can we expect from a Trump presidency? This book answers these questions. It presents a clear and definitive overview of his campaign, it controversies and setbacks and its successes. Winning the Presidency 2016 identifies who voted for Donald Trump and why. It explains why Hillary Clinton lost. Essential reading for understanding a campaign with no precedents and a presidential election that could have seismic consequences for the conduct of American government. William J. Crotty is Thomas P. O’Neill, Jr. Chair in Public Life and Emeritus Professor of Political Science at Northeastern University. He is a recipient of the Samuel J. Eldersveld Lifetime Achievement Award of the Political Organization and Parties Section of the American Political Science Association and the Hubert H. Humphrey Award of the Policy Studies Association. He has served as president of the Policy Studies Association, the Political Organizations and Parties Section of the American Political Science Association, and as president of the Midwest Political Science Association. Among other areas of interest, he has written on political ideology and its policy-relevant applications, democratic development, and he has conducted surveys of black communities and written on a changing black politics. William Crotty and his colleagues have given us a serious and informative book on the 2016 election, which will nourish both citizens and scholars. Both America and the rest of the world badly need it. This is an excellent volume for courses on U.S. elections and the presidency. Nine highly distinguished political science scholars examine an election that was unconventional and divisive – or, in the case of the congressional elections, conventional and divisive – to explain why this election defied expectations, and to consider whether 2016 is the new normal. Winning the Presidency 2016 is a very fine, sober, insightful, and literate analysis of a most shocking election. Through wise and deep analysis that will appeal to scholars, students, and political observers, the authors explain how it happened and what it means, weighing a wide variety of factors – American history, contemporary culture, the campaigns and vote counts, and the state of our democracy. William Crotty has organized eight excellent, penetrating studies of the 2016 presidential election, the most significant election in this century. Scholars and students alike will welcome this new collection. No nine mortals can be expected to explain the inexplicable, but William Crotty and his stellar cast have taken on the challenge and produced a set of insights well worth the read. It’s an explanation of many parts: The roles of institutions, campaigns, candidates, voters, social media, meddling, and luck (good and bad) are all well-explored. In the process, and very importantly, the authors don’t ignore the "normal" while highlighting the many unique features of the 2016 election. As for implications, the book offers not just a significant list of challenges, but also some reasons for hope. The 2016 US election season was like nothing we have seen before. Its centerpiece — the election of Donald J. Trump — has confounded (most) predictions and drawn US democracy into unchartered territory. This new study, edited by one of the founding fathers of the study of American party politics, William Crotty, provides a much-needed perspective on what happened, why it happened, and what it all means for politics and democracy in the US and the world over. Winning the Presidency is a powerful, sobering analysis of the 2016 election. Outstanding contributors apply the best political science theories and data to determine what happened and, more importantly, what it foretells of our political future. The book asks and forcefully answers the question, Has our very democracy been undermined or is this only a political blip? Winning the Presidency should be read by every serious scholar, student, activist, and citizen. 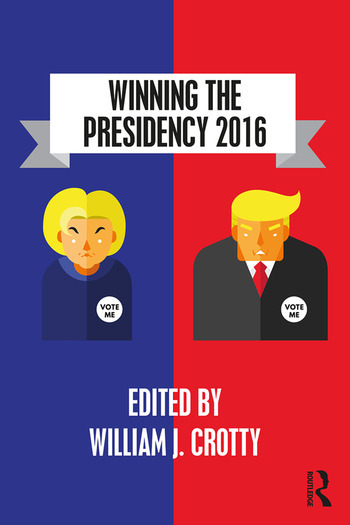 William Crotty’s Winning the Presidency 2016 is a first-rate collection of essays explaining the exciting and wholly unexpected 2016 presidential race. The authors explain how, though at the start of the season it looked likely to be a replay of the Clinton-Bush dynasties, political novice Donald Trump emerged to win the White House. It’s a whole new ballgame. This persuasive book forces us to reexamine our conventional thinking. Winning the Presidency 2016 is a greatly useful and insightful book about a most unlikely election by nine of America’s best political scientists. Impressive for its comprehensiveness, the book covers the political and cultural context, the nomination campaigns, the gender issue, the role of demography, the congressional elections, and the collapse of the establishment and political parties. A valuable review and assessment for students, political scientists, and a general audience. The 2016 presidential election will probably go down in the annals of history as a realignment election. This book focuses on Donald Trump’s surprising victory and Hillary Clinton’s unusual loss. William Crotty and his collaborators give us an inside glimpse at both the Democratic and Republican parties in an attempt to determine how each failed to draw support from traditional voters. Contributors share fresh insights into the party decision-making processes and illustrate the growing disconnect between the party establishments and voters. Will the events of this election yield lessons, and will these lessons lead to changes to the electoral system? Winning the Presidency 2016 is the definitive look at the election, and is an excellent resource on what can be done to bring American democracy into the 21st century. Bill Crotty’s timely, accessible book examines the dynamics behind the unexpected victory of Donald Trump in the 2016 election. Outstanding political scholars offer new insights on nomination fights, the nominees’ perils and promises, conventional and unconventional campaign strategies, explanations for the vote, nuances of gender and Latino politics, dissimilarities between congressional and presidential elections, and potentially seismic consequences of the election for political parties, government institutions, and the country. This book is a valuable, rich resource for students and all citizens. There was little conventional about the 2016 election, and many believe that it left our understanding of parties and elections in tatters. William Crotty has assembled a team of scholars uniquely qualified to cut through the tweets, hacks, and videotapes to explain this weird election. If you want to know which theories still help to understand the American electorate and which ones need serious re-examination, this volume offers a great place to start. Donald Trump’s ascension from real estate developer and reality TV personality to the most powerful position on Earth was met with shock and consternation by most every thoughtful American. Was race the deciding factor in this election? Or was it perhaps economic distress, cultural change, or immigration concerns that motivated the typical Trump voter? In this insightful and perceptive new book, renowned political scientist William Crotty offers one of the few scholarly, empirical explanations of this astounding political phenomenon. This collection will help readers more clearly comprehend the perplexing and complicated etiology of Trump’s rise to power. Winning the Presidency 2016 is an informative and timely work that provides keen insights into the forces at play in the 2016 presidential election. Scholars and laypeople will find this book to be an interesting analysis of not only the election but also its impact upon the immediate future of American politics. William Crotty has collated a series of chapters that will appeal to the political observer and academic alike. The book analyzes the reasons for, and repercussions of, Donald Trump’s success, while at the same time introducing the reader to the complex nature of the American electoral and party system. While it will have an obvious appeal to an American audience, its significance will also resonate with readers in Europe and further afield. One of the many troubling questions to come out of the 2016 election is, "How do I explain this to my students?" Along comes Winning the Presidency 2016, providing the tool I need. It has become a commonplace to recognize the voter distrust and disgust that animated 2016, but William Crotty and the leading political scientists featured here dig up that perception and examine it root and branch. We’ll be studying the 2016 election for decades to come; Winning the Presidency 2016 is an essential starting point. It will take years to fully comprehend Donald Trump’s hostile takeover of the GOP and bewildering victory over Hillary Clinton. William Crotty has assembled a crack team of superstar political scientists and made the first and most significant evaluation to date of the evidence pouring in from Election 2016. Even more valuable is how each chapter takes a different vantage point interpreting the election and how the aftershocks will rattle various institutions -- and indeed shake the very foundations of the republic – in defining the American ethos in the 21st century. If you wish to understand an "election like no other," it's all here: In Winning the Presidency 2016, contributors probe a unique mingling of personalities and events in an election where strategically located white working class voters and late deciders wanted change. Donald Trump personified change more convincingly than any major party nominee in memory, while Hillary Clinton seemed wedded to the status quo. The chapters on women and Latinos are especially insightful and revealing.